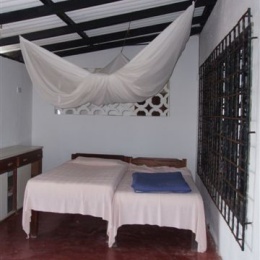 This is a secure, roomy, airy and informal place with plenty of charm situated on the beach front within walking distance of all other hotels, bars, restaurants and water sports facilities. The house consists of an open-plan dining area with traditional dining room opening onto verandah and out into the garden. Comfortable living room with large bar cooler. Of the three twin rooms, two are en-suite. We can set up two extra beds on the enclosed, lockable verandah expanding our capacity to 8 if needs be. The kitchen is fully equipped and a cook is available to you. This place is ideal if planning a holiday at the world famous Watamu Beach. Secure environment, member of Watamu Against Crime, patrolled regularly by community police. Resident watchman on property at night with mobile alarm. Panic button system available, fixed and mobile. World class diving available through Aqua Ventures (diveinkenya.com) at the Ocean Sports Hotel next door. Deep Sea fishing and other activities available on request. BBQs to be supervised by staff and at the back of the property only because the roof is made from local dry roofing material.